Linen spray is perfect for adding a scent boost to your bed sheets or even freshening up your linen closet. You can use your favorite essential oil combinations or go with a classic like lavender. Lavender is known to help with nervousness, anxiety, stress and sleeplessness. This makes lavender linen spray perfect for spritzing on your pillows right before bed. If you have a cranky toddler or know someone who has trouble sleeping, this spray can help, along with a relaxing bedtime routine. I prefer to start off with distilled or filtered water. This is solely because I want to make sure that water will not leave behind any residue after it evaporates. Also, by using distilled water, your mixture will last longer (less likely to grow fungus). Add the witch hazel to the distilled water. The witch hazel (or vodka) will help the mixture evaporate faster and also help preserve it. Add about 10 drops of lavender essential oil to the mixture. Carefully funnel/pour it into a glass spray bottle. Spritz your linens before bedtime, or spritz your linen closest periodically to help keep linens smelling fresh. 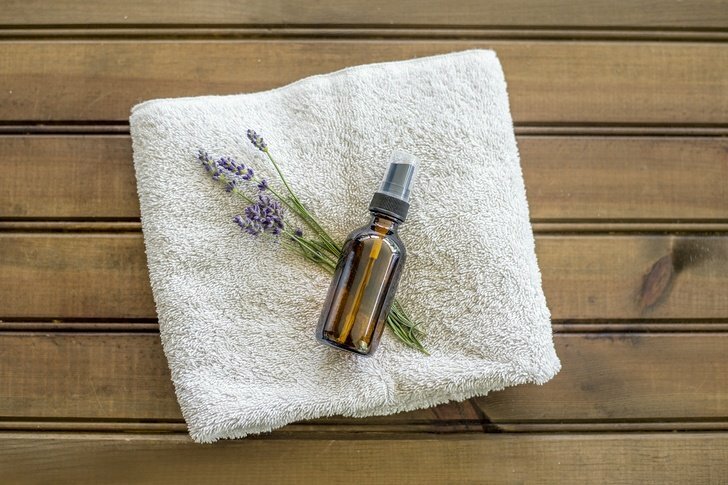 The best thing about linen sprays is that they are great for large items that can not be run through the washer like sofas, rugs and stuffed animals. And, due to many of the antibacterial/antimicrobial qualities of some essential oils, they actually work against the bacteria that causes unpleasant odors, not just mask them. Energizing: rosemary, peppermint, lemon, orange, grapefruit and tea tree. Uplifting: bergamot, orange, grapefruit and ylang ylang. Calming & Anxiety: lavender, chamomile, marjoram, geranium and frankincense. Then get yourself a copy of the Everyday Roots downloadable guide with 215+ DIY recipes for making your own natural health and beauty products and non-toxic cleaning supplies. Each recipe is beautifully presented with stunning photography and will save you a fortune as you discover how to stop buying toxic products for your home, health and beauty regime and instead replace with better, greener, cheaper alternatives. Get your copy here.